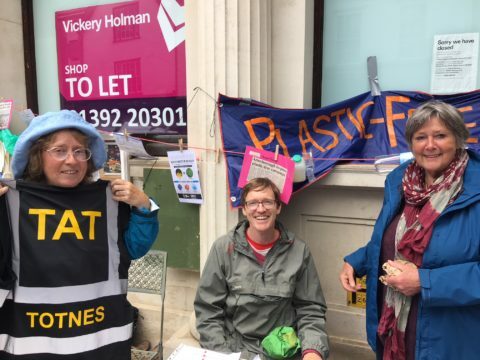 Plastic Free Totnes Campaign (started by TTT Waste into Resources Group) began with all important public engagement on 16th June with a stall opposite the CIVIC Square which generated significant interest. We hope this will be a regular thing on a Friday or Saturday, all depending on availability of volunteers. The projects aims to pull together the whole town, with support from community groups, business, local authorities and local schools in changing behaviour to avoid single use plastics (SUPs) and any unnecessary plastics. It is key to point out that plastic is an amazing material with so many good uses (but oh so persistent in the environment) however it is our misuse of SUPS driven by our throwaway culture that has led to one of the biggest environmental crisis of our time. Since the awareness jolt brought about by David Attenborough and Blue Planet too the group has decided to focus on plastics for campaigning as the key issue. A Film night planned for August at the Royal Seven Stars Hotel, Totnes to screen ‘Bag It’ by Jeb Berrier, a very informative and impactful film. Date tbc. We are working towards Plastic Free Community accreditation with Surfers Against Sewage campaign. 300+ communities nationwide are taking this approach so we are excited to be on board. We are encouraging people to take the ‘Plastic Challenge’ with Marine Conservation Society, which challenges people to go plastic free for one month in July- go on, you can do it! The group is linking up with Totnes Rubbish walks (litter pickers) and also a new group ‘Totnes Against Trash’ led by Phil Nash who invested in lots of litter picking equipment for the group, and attended the June TTT Waste into Resources group. He energised us all with a ‘Just Do It’ attitude and invited members to attend a litter pick on Tuesday 12th around the town. Over 20 people collected approx. 750kg OF litter and all recyclables were picked out and recycled. Thanks to SHDC who took the non-recyclable waste for disposable. The group is now poised to break from its monthly Thursday night meetings to instead focus on action groups to energise the public engagement and to organise a film night and other events. There will no Thursday evening Meetings of TTT waste into Resources in July or August or the forseeable future as we are change mode from talking to Doing! Email Ben at info@dcrn.org.uk to get involved.